These are ten of the best. A film with subtitles doesn’t mean it’s better than a film without. A low budget doesn’t correlate to better than big budget. Foreign films have no quality presumption over American films. A movie with huge success at the box office is no indication of merit. The cinematic lost-footage-found device is a gimmick and nothing more. Paranormal Activity is a no/low budget movie that takes place in one location (a house). That in and of itself would be industrious but The Anniversary (1968) showed how such limitations can be filmed well. Where that film was kinetic Paranormal Activity is static and laboured. It does strive for and achieve dialogue vérité but in doing so exposes the weakness of the plot. At best stretch this should be an episode of The Twilight Zone/Fear Itself/Masters of Horror (ie one hour running time less 15 minutes of commercials). With a miniscule plot it is character that has to propel this story. Katie and Micah are a yuppie couple in a new condo. She’s a whining shrew. He’s spineless and downtrodden. In the 70s there was a British sitcom called ‘Yes, My Dear'. That was funny. This is stereotype hell. To tell a story one has to engage the viewer/reader/listener. A lot is to be said about hiring attractive looking people (ie women) in movie roles. It induces sympathy. The actress Katie Featherson – who is no talent - induced my apathy, irritation then malice. I couldn’t wait to see her get hers. Her and her husband. The dénouement of this film is disturbing. It has been years since I had a bad nights sleep due to a horror movie. Though the final sequence does not justify the tedium of the prior 80 minutes I cannot deny its power and effect (I must declare an interest: I am a lapsed Pentecostal Christian). This is what The Exorcist did in 1973. For that reason alone, begrudgingly, I include it. This studio offering is as formulaic as baby milk. After a befuddling prologue the film settles down into psychological drama à la Rosemary’s Baby (1968). With a running time of two hours Orphan is a slow boil build. 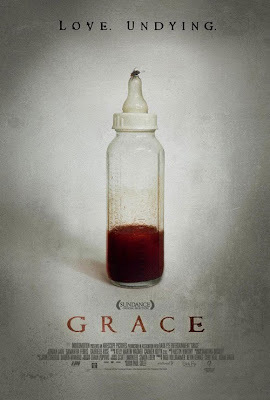 It is the story of a young family of four: mother miscarries her third child so they decide to adopt. They choose a 9 year old. She is the child from hell. Joel Silver produced the Lethal Weapons, the Die Hards, the Predators, the Matrix(es). He will come with a big budget. Big budget means better actors (than the genre deserves). Husband Peter Sarsgaard brings a calming effect to wife Vera Farmiga’s growing anxiety - a ying to her yang. Farmiga exudes insecurity, doubt, jealousy and hysteria. She almost convinces. The best acting goes to 8 year old Aryana Engineer. She does not play the child from hell but is an actor of prodigious talent. Her role is mute. Her display is through facial and body language. She convinces. The critic Mark Kermode in discussing thrillers – specifically Lakeview Terrace (1998) – said such films with a detailed, intricate build up often disappoint in their dénouement. 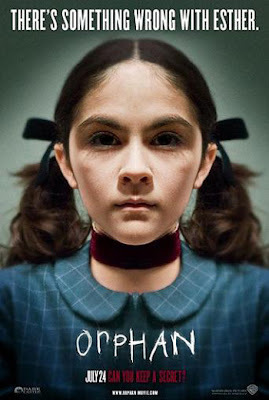 I was waiting for the reveal of Orphan knowing that if the writers could pull it off it would be earth shattering. Alas the reveal was moronic to the point of insulting. The salt in the wound was taboo. It does take Orphan 90 minutes to fall apart and that’s 90 minutes of goodwill. Orphan is only a movie. It’s not art – its entertainment. It will be forgotten beyond 2009 but it is fun to watch. There’s a formula to scary movies – a template - which I like. When filmed well said template supersedes the formulaic and at the very least is going to be entertaining. The Short Cut raises its signpost at the opening credits. However what appears to be prologue turns out to be a parallel storyline. The main story is that of new boy in town/school Derek. He makes a best buddy, is befriended by a cute tomboy, woos the soccer princess and is recruited by a jock to find the latter’s missing dog. This is the Scooby Gang. Their hi-jinks lead them to break in – sneak in – the house by the woods owned by the town’s creepy old man. The gang is pivotal because it is they, the characters, who elevate this flick. Thus when the killing starts none of them deserve to die. Kudos goes to Shannon Woodward, Dave Franco and Josh Emerson for their performances. The dialogue plays its part but it is the well written plot and sharp direction that deliver the thrills. There are tension soaked set pieces aplenty such as Derek and the jock’s foray into the barn. There are also horror moments - when the old man turns up at the diner. The parallel story line is psychological horror in itself. A pity these scenes are so brief – but they are effective. 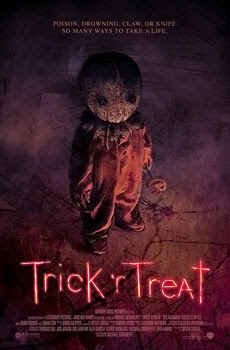 This is what Rob Zombie should have done with Halloween 2. The cell phone that doesn’t work is a lazy cliché in today’s horror. At least in this film writers Dan Hannon and Scott Sandler set that plot point up. They set up every key event in this movie including the tacked on twist ending. The twist does make sense but is emotionally unsatisfying. Nevertheless this is a pocket rocket of a movie. It was easily missed in the big budget barrage. Director Nicholaus Goossen proves he’s better at this genre than wunderkind Richard Kelly. I watched this blind ergo I believed I was watching a film from the 80s (how could I have missed this for over 20 years?). Even when Tom Noonan turned up I didn’t twig - the film was that convincing. Afterwards I felt embarrassed; I know what Tom Noonan looked like in the 80s (Manhunter 1986). On reflection there was an overriding clue that should have alerted me: when watched today all 80s horror have the dated factor – be it dialogue, acting style and/or ambience. This film captured the 80s too well to be authentic. From the title cards to the shooting style (and the obvious in between) everything in The House of the Devil screams 80s. It begs the question is this a period film or is the filmmaker asking we the audience to regress to a period of different expectation? The epigram now reads like disclaimer. The best horror films build their characters (Candyman 1990) then build the conflict (Invasion of the Body Snatchers 1976) then reveal the big bad (Halloween 1978): university student Samantha needs the money to move into her own digs. She answers an advert for a babysitting job and arrives at a creepy house. The ad turns out to be false. Tom Noonan doesn’t want her to sit a baby he wants her to watch over his elderly mother-in-law. Samantha doesn’t want that job. Noonan ups the ante. The sight of money takes the better of her. She demands more. The budget reveals itself in the lack of milling extras. This has to be the quietest university campus in cinema. Other than that the story moves at a reasonable pace with all the gaps being filled. Then comes an isolated incident of violence. It is sudden hence it is shocking. Henceforth tension imbues every scene and escalates. The reveal is nonsensical. The epigram did signpost it. We were asked to regress to an earlier time. Tom Noonan is suitably cast and domineers. Actress Mary Woronov adds to the creep factor exponentially. It’s always a pleasure to see an actor revel in her talent and leave it on the screen. 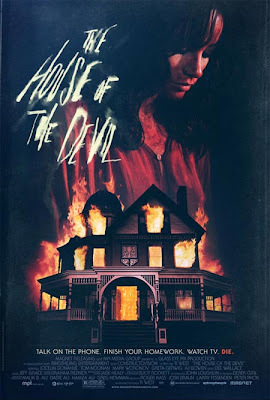 If The House of the Devil was made 25 years ago actor Jocelin Donahue (as Samantha) doesn’t fill the screen à la the Brat Pack or Christian Slater did. Her Samantha is more sub-Heather Lagenkemp. She’s only an adequate final girl. This is a glorious failure of an experiment in retro filmmaking but an enjoyable horror flick nonetheless. This film takes place over the course of one night resulting in a pace that does not pause. Zakes is driving with Beth on the M1 motorway. Theirs is a relationship in death throes. She’s cheated on him and he doesn’t know it. She wants to be with him and he doesn’t know it. He doesn’t know if he loves her or if it’s force of habit. While Beth sleeps a white truck overtakes them in the rain. Its shutter rolls up briefly. Inside there’s a caged woman – screaming. Zakes phones the police but he can’t read them the dirt encrusted plates. He gives them his approximate location. He’s done his bit. Beth screams at him to follow the truck. No way. He pulls off at a services. She sits down for a coffee and splits up with him. He goes back to his car but can’t bring himself to drive off. He goes back in the café to look for her. She’s gone. Outside he sees the white truck drive off. What follows is Zakes pusuit of the truck. The stress level is at magnitude throughout this film. There are set pieces aplenty: the initial entry into the trucks cabin, the interlude at the country house, the face-off in another services men’s room with two oblivious coppers present. Zakes can’t alert them. No spoilers but Hitchcock would be proud. The edit is frenzied. The shooting is frantic. This is a thriller that uses horror motifs. The big bad is shroud-like - imposing, huge, menacing, mute; a Michael Myers sans the supernatural. It is his dread that elevates this thriller into horror. Add this film to Eden Lake (2008) and The Descent (2005) and this could be the birth pangs of a British horror renaissance. Hush was released in the US via IFC On Demand. A home awaits it on DVD. Click poster to read my review at A1 Movies. Click poster to read my review. There is a (brief) prologue, as obligatory in horror as the twist ending, though in The Sceptic it is germane to the plot. Lead character Bryan Becket is played by Tim Daly in a performance of stoic indignation. Becket lodges at his late aunt’s house – a Victorian mansion – while he contests her last Will and Testament. He begins to hear things. He begins to see things. He doesn’t believe in ghosts. The intelligent writing leaps off the screen from the first scene forward. In a dumb down landscape (that includes television and popular fiction as well as cinema) it is rare to be told a story with respect for intellect. The pace is steady but does not pause for dullards to catch up. Through dialogue, ie conversation, the back story emerges. Becket isn’t just a sceptic he’s a cynic. He moves into his aunt’s house to get away from his wife and her mid-life-begins-at-40 crises. The house begins to talk to him. 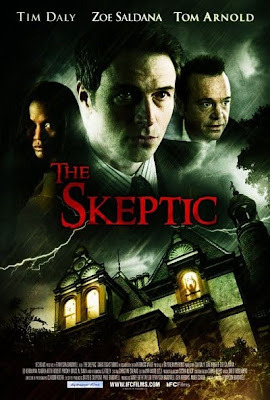 In a TV landscape full of ‘Most Haunted’ fakery The Sceptic offers scientific explanation, as opposed to dismissal, of what the superstitious call the supernatural. With not one teenager on the cast it offers wit instead of humour, quips instead of jokes, anger instead of spite. There is also maturity. The friendship between Becket and Tom Arnold’s character is warm and reassuring. Their final scene together is genuinely touching. The main criticism is of Zoe Saldana – not her character. Zoe’s performance is so off key it is hard to determine whether she was playing the seer for laughs or not - which is a shame because Cassie is integral to the plot. She holds Beckets hand as the house gives up its secrets. The reveal comes at the end sequence. It is a genuine terror moment. There is no trick ending. This is a film with its horror displaced. Horrific things are expected to happen which they do but horror – fear – is not the overriding emotion. Events unfold in Sweden where people live in the snow. Where there’s not much to do but stay indoors and drink. That will break a people. It is morose tundra. Oskar is being bullied at school. A father and daughter move into the apartment next door. He’s not her father. She’s not 12 years old. She’s a vampire. The imagery is stark. The cold landscape transfers itself to its inhabitants. These are not a warm people. The first murder is in long shot amongst barren trees. The father – Håkan – is the watchdog. He suspends the victim and bleeds him like a pig. The slaying has a perfunctory cold air to it. Man must kill to eat. Vampires too. Oskar is tyrannised and terrorised at school. He is alone at home with his single mother and lonely when visiting his drinking father. He fantasizes - with a knife – of extreme violence. The spectre of Travis Bickle looms. The spectre of Eli – the vampire – watches. It’s easy for him to make friends with her. The bullies haven’t completed breaking his spirit. There are camera shots, flourishes and compositions of cinematic astuteness. The grey people against the snow white backdrop have a baroque beauty. There is horror - witness the feline attack – but that is not the overriding emotion. It is pain, yearning, lonliness and hopelessness. There is triumph but it is pyrrhic. To watch the end of this movie is to watch a relative drive away. From your vantage point you spot a speeding car on an adjacent street. You can see the accident before it happens. You shout and you scream but your loved one cannot hear you. You faint before the collision. 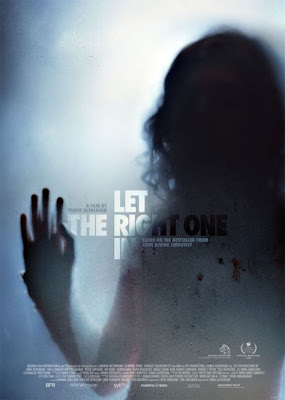 Let The Right One In is one of the best films I have ever seen. There were plenty to choose from. There weren’t enough good ones to go round. Giallo by Dario Argento had a roaring third act but that wasn’t enough to save a clunking mess. The Box was plain stupid. Triangle was a British rip of Timecrimes (2007). The Haunting In Connecticut was a star vehicle that spun into a black hole. There are more. They are painful. 2010 promises Shutter Island from Martin Scorcese, Case 39 starring Renée Zellweger, remakes of The Crazies, A Nightmare on Elm Street and Let The Right One In (gasp). Don’t hold your breath. It was a year. Here comes another.